A great website homepage is without doubt one of the most important pages on your website. You never get a second chance to make a first impression. Visitors will decide to stay or leave your site within seconds if it is poorly designed, contains weak content or has no clear call-to-action. Follow my 5 step guide to improve your website homepage below, which will provide some insights on creating a better experience for your visitors. We see something moving and we are instantly captivated by it. Have you ever been in a bar and spotted the TV? You can’t ignore it right? So like an image slider, you concentrate on this element of a webpage and forget to look at the content below which really matters. So if the slider image isn’t up to much, that viewer moves on. Everywhere you look on the internet these days, we are bombarded with moving images and advertising. We tend to ignore them. So, much like a slider we tune these out. It’s called Banner Blindness. Most of the time, any messages that do appear are gone within a few seconds. And I don’t know about you but I don’t sit there waiting patiently looking at every slide. I’m into the rest of the site or I move on. So the best advice is to focus all content to inform the audience with one or two key messages. This is far more effective. Their is a good post that explains all this in more detail over at ConversioXL. Well known brands or celebrity sites don’t necessarily need to convey what they do. But a homepage for most small businesses needs to convey a message clearly and accurately. The general rule to remember is – It’s NOT about you, it’s about YOUR audience! Keep it fairly short and direct, and don’t use jargon. Try and stick to the language that the target audience will understand and don’t include a load of marketing gobbledygook. Once you’ve got your prospects to visit your site you need them to interact with it in some way. Give them a reason to stay. Remember, the goal of the homepage is to compel visitors to dig deeper into your website and move them further down the funnel. CTAs tell them what to do next so they don’t get overwhelmed or lost. More importantly, CTAs turn your homepage into a sales or lead-generation. This is a great way to personally welcome visitors to your site. Adding this ‘personal touch’ will keep visitors on your site for longer, which in turn lowers your website bounce rate. It also shows that you are real and gets your personalty across. If you aren’t using social media yet, then it’s time to start. Obviously the main ones people use are Twitter, Facebook, Google Plus, Linked In and Pinterest. I’d certainly recommend signing up for two or three of these. 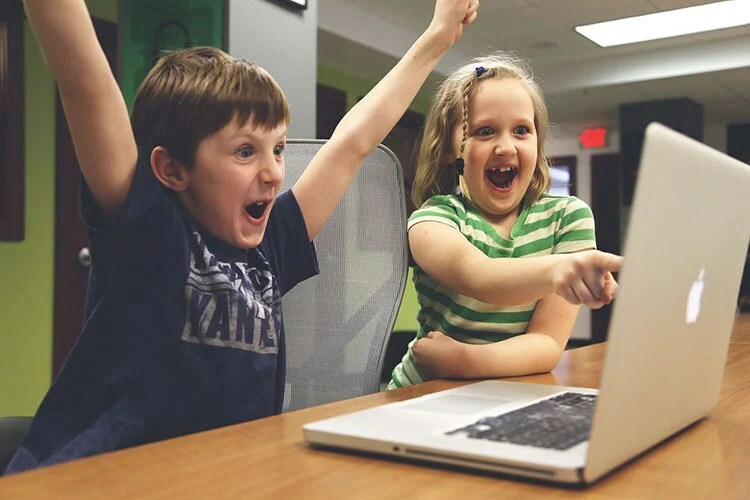 Apart from helping you to connect with an audience, it also provides a set of easy to use call-to-action buttons. Place these in the header or footer areas of your site so they can be seen at all times. If you have a blog on your site and you regularly publish content, then I’d recommend setting up a newsletter signup form. This can be in the footer or even better as a popup window. This encourages visitor to keep in touch. And more importantly you get to store a database of their email address. Whether you are selling products or services, the most effective way to get visitors attention is by using an action button. Get started! Learn more! Download this mega bundle pack today! These are usually preceded with a bold headline, a short piece of copy and a reason to click. Love them or hate them, they do grab your attention. A good homepage layout is highly usable, meaning it’s easy to navigate around and it doesn’t include flashing or sliding objects that get in the way of the browsing experience. Most sites are also mobile and tablet friendly, which is an incredibly important must-have in today’s multi-device world. Adding a blog or regular new content to your website is always a good idea. Combining a list of blog posts to your homepage is even better. Search engines love new relevant content, so consider adding a few snippets of your latest blog or news articles. If you can combine an image as well then this is even better. 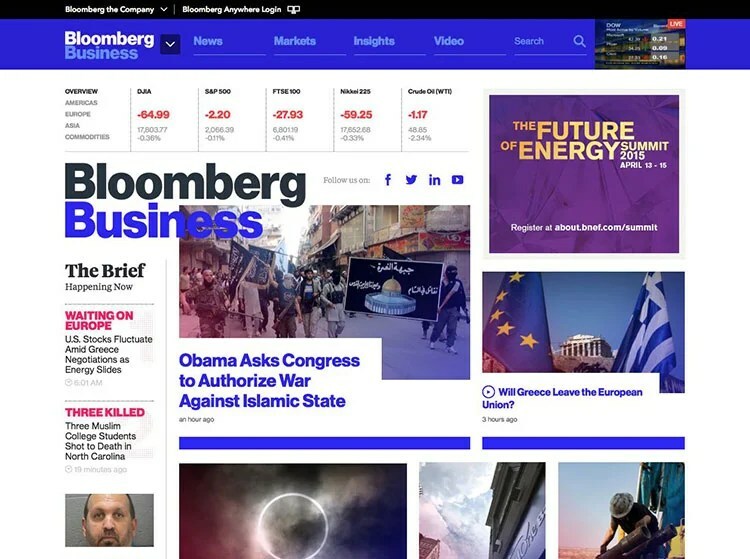 The Bloomberg Business homepage works really well as a design. It has solid branding and displays it’s news articles in a neat and logical way. The site is optimised so it works well on different devices. The use of a strong colour palette and excellent photography draws you in. It separates its content into sections, much like a Sunday newspaper, so you can easily go to your favorite items. Being aimed at business users it even shows stock market figures at the top of the page. There is a tonne of information to display but it just shows with a bit of thought you can create a logical and effect layout. 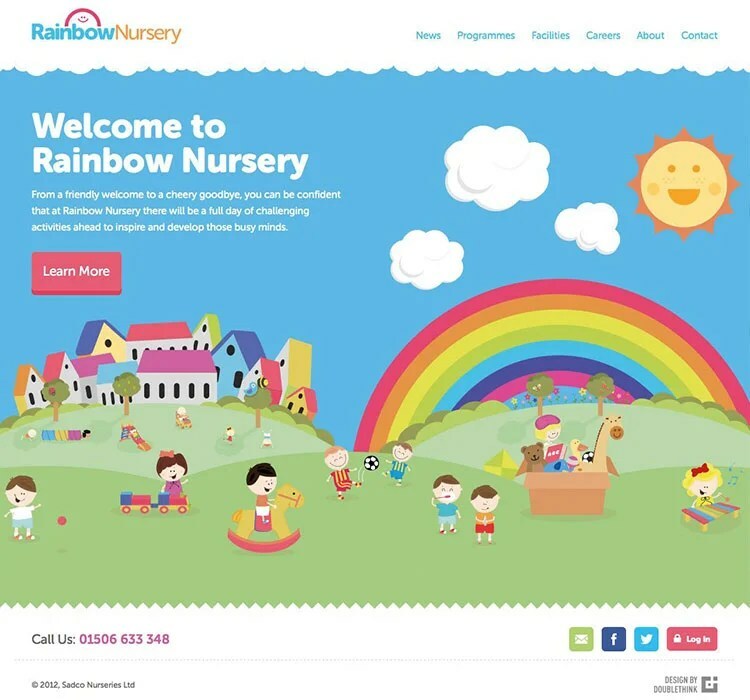 The Rainbow Nursery homepage is fun, colourful and has a delightful animation. A welcome message clearly demonstrates who they are and what they do. This is backed up with a clear call-to-action button, telephone number and social media links. The market is aimed at children and parents, so the playful design is spot on and very inviting. 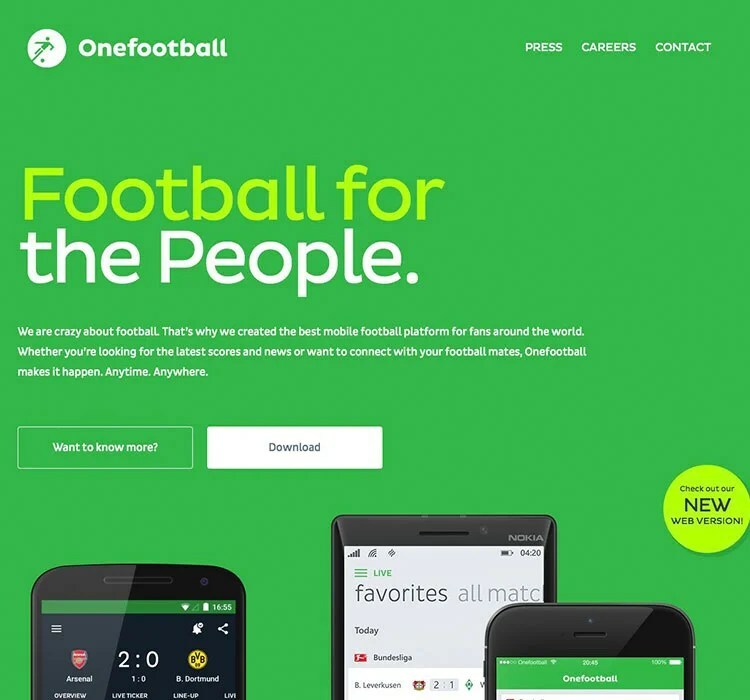 The Onefootball homepage is simple, colourful and has a clutter-free strong design. It’s message is clearly about a football App and it’s aimed at the fans. There are 2 big call-to-action buttons, so there is no guessing what to do next. The App’s features are clearly outlined as you scroll further down the page. 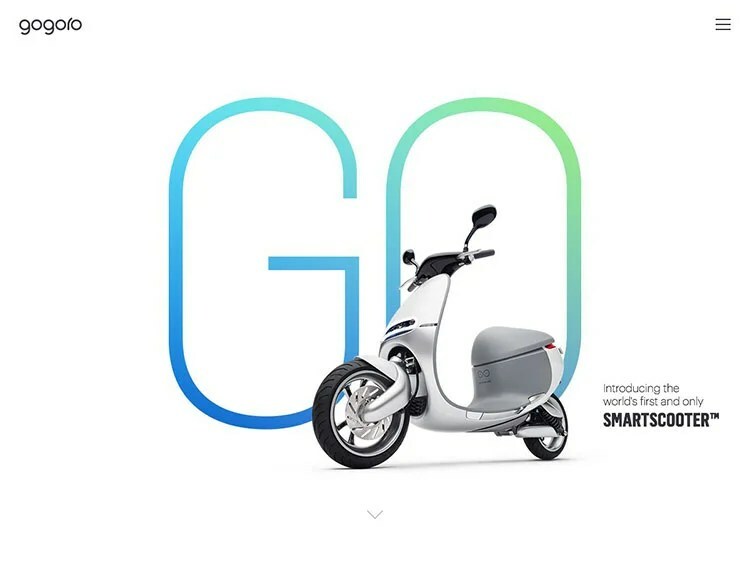 The initial Gogoro homepage is extremely sparse but is beautifully designed. And you certainly know what the site is about. Once you scroll down you are wowed by wonderful images and details about the scooter. At the end there is a call-to-action to join the emailing list. The design reminds me of the Apple website. Stylish and effect. Did this give you some inspiration? Do you have any other homepage tips? If you enjoyed this article on how to improve your website homepage please share.